Elite athletes amaze me. Especially between the big events. All that work, all that training, all that discipline for the sake of a few seconds that on the day, can make all the difference in the world. Months of effort for minimal time that can give maximum impact. Incredible to be so disciplined for three seconds, until you know what that three seconds can give you. It all seems worth it when you know what you can become by it. Growth is about who you become. What you have is a result of who you have become. Jim Rohn says we should all make it our goal to become a millionaire, not for what we get but for who we become. Sage advice when it comes to growth and transformation. He also reflects on growth and says in his memorable and motivating way “It’s easy!” While he refers to the idea that an apple a day might be helpful, and if it is why isn’t everyone doing it? In the same breath, he captures the human condition perfectly when he observes “It’s easy NOT to!” The idea of growth and transformation sits on these two polar opposite ideas. It’s easy, says the elite athlete, the corporate leader, the sought after speaker, the widely productive parent of four unrecognisably talented kids… And, it’s easy not to say the cynic, the broken, the bitter, the disappointed and the hopeless. If diet, sleep and exercise were easy then, why carry the extra weight? Because it’s easy not to. If writing a book was easy then why isn’t it published yet? Because it’s easy not to. If that business idea, relationship, opportunity and next step in life and leadership were easy then help me understand why there are days when they seem so elusive. Because it’s easy not to. 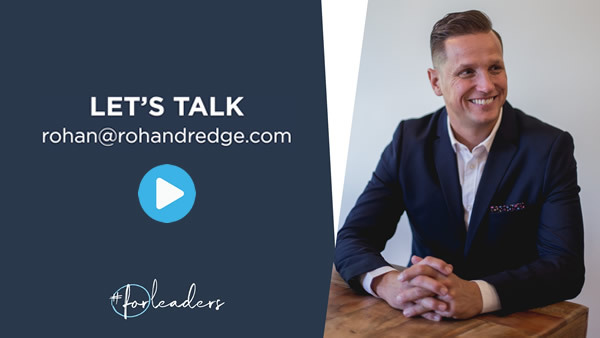 I explain how this third stage of Leadership Development works in this short 50 Second Video below. Let’s gamify this and say growing as a leader is easy. (Which also means it’s easy not to.) Which side of the equation do you want to be on in the next 90 days? Let’s assume it’s the “easy to grow side.” Let’s assume you have bought into what Carol Dweck calls the ‘Growth Mindset‘. Skills Creation is learning and growing in areas we either have to or want to. Here are five execution steps that will radically increase your experience of success and you’ll notice the motivation following the action. Leadership has a list of ‘want to’s’ and also a list of ‘have to’s’ – things you simply must get done because you are in a leadership position. When you list your responsibilities appropriately you are able to see what you need to do to skill up. Your role requires things of you that you can’t do yet, that’s your first point of growth and transformation. Themes are better than goals, I have been writing about this for some time now. A theme is where a goal goes to live. A theme is a bigger responsibility or idea that you THEN place goals under. For example, my three personal themes are Husband. Father and Friend (or Son, I use it interchangeably) and my three commercial themes are Leader, Communicator and Mentor. Having named them I am able to identify what goals I want to achieve under each of them. My health, family and financial goals sit under my personal themes. My business and commercial goals sit under my professional themes. The theme helps me find a context and a reason for the goal, and it is so much more motivating. Leadership and life are too short to invest time, money, and energy into incremental gains in areas of weakness. Don’t do it. Before you race into the boss’s office and hand in your resignation because your job isn’t ‘playing to your strengths’ quickly reread Point One. You have responsibilities and nobody ever promised you’d love all of them all the time. I love being a Dad, I can’t say I love the 3 am wake-up calls. I love leading but my education never prepared me for conflict resolution, handling criticism and facing my own insecurities. Leadership isn’t perfect but it is better when you put the right amount of energy into your top strengths. On the other hand, knowing my primary skills, my personality, my enneagram, my Gallup Strengths, and My Instinctive Drive all serve to point me in a direction of development and transformation that becomes clearer over time. For example, I am at my best if I can ‘finish my day before it starts’ so time in the morning or the night before to organise my desk, my diary and any details that serve that focus makes a big difference to me. I prepare as much the night before as possible. I write emails when I think too but schedule them to arrive at more opportune times. I have a leadership bias and a passion for communication so I am consistently seeking out new ideas around those areas. When you know your strengths you can invest in them and expect a better than average return for you and those you serve. One of the hurdles of leadership in the 21st Century is how public our private world is. A beautiful point of difference while you’re being on brand or a viral fail that you may not recover from. What we must recognise is, most everybody is not as interested in us as we think (or hope) they might be. The challenge of this is many people present their best self, or at least omit the really bad parts, which can create the illusion that we have it far more together than we have. Carey Nieuwhof says “People admire your strengths but connect with your weaknesses.” I’ve found that to be true in leading and moving teams and organisations forward. Your goal as a leader is to model authenticity, humility and invest diligence in getting better. Make progress, just a little bit better, each time. Fall over? Get up. Not sure what to do next? Ask somebody. Tempted to quit? Persevere. Perfection will beat you every time, progress will make all the difference. Change is happening all around us, growth, in order to lead at the front of that change, is not an optional extra for leaders. It has to be part of our rhythm and disciplines so we can grow consistently, contribute effectively and reach our maximum potential, for the sake of ourselves and the sake of all those we serve.